This weekend's giveaway comes from a local (to me) artist who specializes in animal portriature. 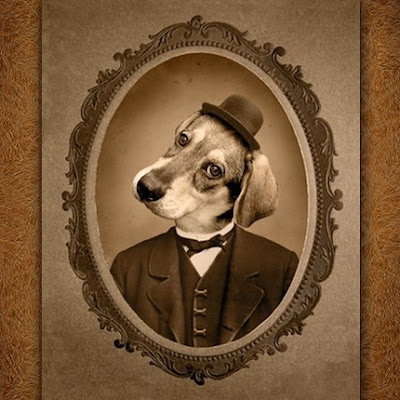 I had a friend get two custom dog portraits for her husband's Christmas gifts and I immediately fell in love with Hot Digital Dog's quirky, unique, cheeky, vintage style. These portraits are meant to make you laugh; I can just picture Kya and Bella's silly mugs in these get-ups. Cindy has asked me to pick 3 portraits to giveaway to one lucky reader! Three (that's a $45 value)! If you've been looking for additions to your art wall or you need unique gifts for friends, this is the giveaway for you. Winner gets all three of these sweet beauties! If you'd like to get your own custom pet portrait, you can receive 10% off, just tell Hot Digit Dog you're a D&OC reader upon checkout. How To Enter (3 entries). 1. Visit Hot Digital Dog and tell me what you think. Does one particular portrait make you smile? 2. Are you a reader/follower of D&OC? Awesome! You get a 2nd SEPARATE entry. Just say, "I'm a follower." 3. Blog, Tweet, or Facebook about this giveaway and let me know you did. (3rd entry). Have a very happy weekend and good luck! Winner will be announced next Wednesday morning. OMG. This is right up my alley. That mouse is pretty delicious too. These portraits are still making me tee-hee! These are absolutely adorable!! I love Vintage Joon (http://www.etsy.com/view_listing.php?listing_id=33237795) - such a cute kitty! I love her high collared dress too. These are so cute. I have a little silver bunny that that could be a great poser too. Thanks for that etsy share! Who new? That little "Vintage Joon" with the rhinestone hair bow, the Victorian high neck dress and the gold heart locket...just pulled me in. SO FUNNNNNY! This is the PERFECT thing for my bf's birthday. He would DIE! 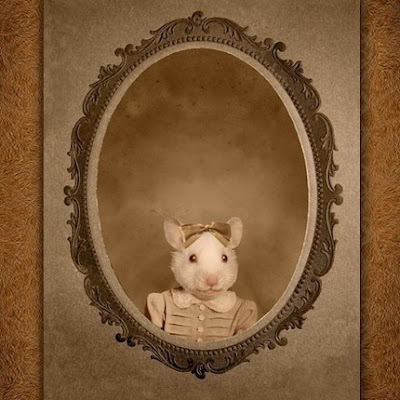 Love the custom pet portraits flickr stream! These are great - so whimsical! 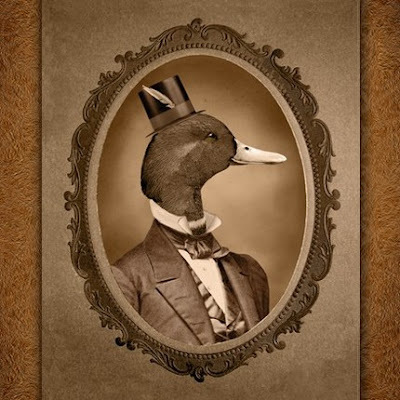 I love Mr. Quackers duck portrait. 2nd entry - I'm a follower via Google Reader. And i love these pictures!! They make me wish i had a pet so bad. Great giveaway!! Have a bright, bold, and beautiful weekend Christina!! these portraits just made me laugh out loud! of course i am partial to them ALL (especially the kitties)! these portraits are SO cute! i love the mouse one! i'm there! these are absolutely hilarious!! I'd love to have one with my two pups...that would be my fave! Love the little mouse. Precious! Yaaay, thanks for a fun giveaway! I love the Boxer and Pit Bull in the hot digital dog section! Oh that duckie!! Very cute! ...and I be a follower! I love the Bunny Boy, these are so cute!! Dolly Kitty is about the cutest thing ever! I made my husband pause his movie so he could look at it. the cat ones are AMAZING. they are hilarious but just pieces of art at the same time. Only one? These are hysterical! I especially love Vintage Joon! So cute! These are all just incredible! I work at an animal shelter, and operate a rescue from home, so I see all kinds of pet-themed stuff, and most of it? Crap! But this is so clever - I love it all! If I HAD to pick a favorite, it would be the mouse. Or the ducks. Or the rabbits? Never mind, I can't choose! I love the bunny one!!! OH OH I LOVE these!! What a cute idea. They would look fantastic on my living room wall. These are just too cute for words! I really love Miss Dewdrop Mouse, but not only...I really like Eugenia Duck and Vintage Boxer and... all of them really! Wonderful work! I love the Hot Digital Dog Dolly Kitten! It was hard to pick - they are all so cute. i think the cat ones are hilarious! oh my gosh! I love these! I might seriously have to have these made of my cats. for reals. i am in love with all of these...i may need to add one to my collection! Hi! I visited and loved all the portraits! What a clever idea. The image that makes me smile is the mouse. OMG these are so great, they really made me smile.I couldn't choose a favorite, I love them all. Oh! I forgot to mention that I would love to feature these on my blog, hope thats ok.